The White House took a firm stance on Tuesday in outlining why an immigration program created by President Barack Obama needs to be eliminated. President Donald Trump and Attorney General Jeff Sessions described the Deferred Action for Childhood Arrivals program as an unconstitutional action that contributed to a surge in immigration and gang violence in recent years. They also said it hurt the economy by taking jobs away from Americans. THE FACTS: Some DACA critics contend that the program signaled to Central American children that they would get similar treatment if they came to the U.S., but there is scant evidence to support the claim. The Government Accountability Office found that the main reasons for the surge of unaccompanied children from El Salvador, Guatemala and Honduras in 2014 were crime and lack of economic opportunity at home. Other reasons included education concerns, desire to rejoin family and aggressive recruiting by smugglers. Some DACA critics contend that the program signaled to Central American children that they would get similar treatment if they came to the U.S., but there is scant evidence to support the claim. The 2015 GAO report said perceptions of U.S. immigration policy played a part, specifically because some believed that prospects for a broad overhaul of U.S. immigration laws would include a path to citizenship for those already in the country. The 25-page report made no mention of DACA. At a lengthy congressional hearing in June on unaccompanied children who belong to the El Salvador-based MS-13 gang, senior administration officials made no mention DACA. Carla Provost, the acting Border Patrol chief, said 160 unaccompanied children who were arrested crossing the border since 2012 were suspected of having gang affiliations, including with the MS-13. But none of the officials offered any estimate of how many are currently in the U.S. and whether they became members after coming to the country. THE FACTS: Few economists or business leaders subscribe to the administration’s view. The unemployment rate is near a 16-year low, and U.S. companies are seeking to fill 6.2 million jobs, the most on records dating from 2001. Many companies are practically begging for more workers. Some analysts argue that automation in factories and warehouses is picking up in part because of a shortage of available employees. For the economy to grow, it needs both more workers and to make those workers more efficient through investments in machinery and technology. The U.S. population is aging, more people are retiring, and that has restrained the economy’s growth in the 9-year recovery from the Great Recession. Immigrants help offset that trend. The unemployment rate for African Americans fell in June to nearly the lowest level on records dating back to 1976. It has since moved higher, but it is low by historical standards. Even in a healthy economy, some Americans will be unemployed as they switch jobs or start looking for work after completing their educations. It’s a stretch to say that “virtually all other top legal experts” believe DACA is unconstitutional. It is a highly contested issue. THE FACTS: It’s a stretch to say that “virtually all other top legal experts” believe DACA is unconstitutional. It is a highly contested issue. More than 100 law school professors and university lecturers wrote Trump in August to insist it’s legal. “In our view, there is no question that DACA 2012 is a lawful exercise of prosecutorial discretion. Our conclusions are based on years of experience in the field and a close study of the U.S. Constitution, administrative law, immigration statutes, federal regulations and case law,” they wrote. 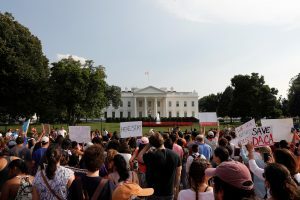 Left: Protestors gather Sept. 5 outside the White House to protest President Donald Trump's plan to repeal DACA in Washington, D.C. Photo by REUTERS/Aaron P. Bernstein.